Alan refers to us as an "increasingly inaccurately named bookstore"
Sometimes we joke around the store about how we barely even sell books here -- we are so inundated by other amazing historical material. 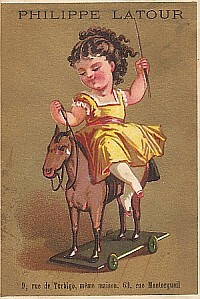 One great example are these fabulous, semi-insane Affordable and Interesting Victorian marketing cards. I had a really hard time choosing just six of them to show you, gentle readers -- we've got a whole boxful! Fortunately (or perhaps un), a recent customer already bought up all the ones that featured little children dressed up as insects and snails. I can't even begin to imagine what the Victorians were thinking when they decided to use some of these images to advertise their businesses. 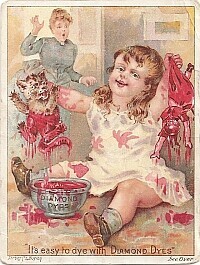 I mean, I'll accept that quasi-demonic children drowning cats in ink is a fabulous promotion for dye! 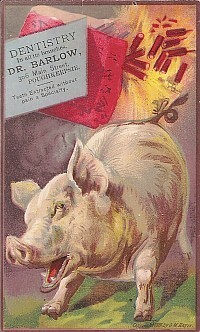 But what does a pig frightened by firecrackers have to do with dentistry? 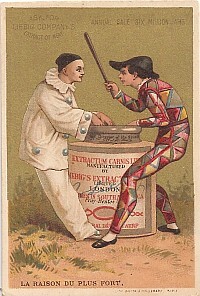 And do you realize that those two clowns are eyeing each other over a pot full of "meat extract"? 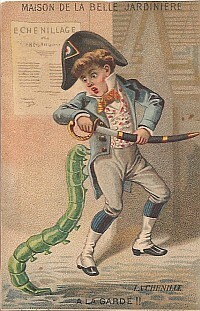 These cards are $3.00 apiece, which I consider a low price to pay for the opportunity to raise our eyebrows yet again at those crazy Victorians. I find that frequently, the phrases I use require extensive explanation (for instance, I recently really confused some friends by saying, "Don't look a gift horse in the mouth"). I mention this because there is a wonderful phrase -- "tilting at windmills" -- that means "attacking imaginary enemies". It derives from the Quixote scene above, and even if you have not read the book you can probably figure out what happens in that scene. Ah, Quixote ... you taught us farce. 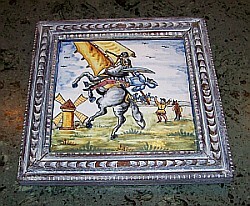 Celebrate Don Quixote with these tiles: $150.00! We've just gotten in a number of amazing prints, now hanging all about the store in various positions! Doug is particularly in love with a large, broadside-style printing of Gwendolyn Brooks' "We're The Only Colored People Here". Brooks, a Chicagoan through and through, was a well-known African-American poet whose works gained international fame. This piece is an especially touching bit about the way the world was as it was desegregating, and yet its inhabitants were still a bit uncomfortable when they mixed. In the 1930s, Paris-based Black Sun Press issued a series of large poster-type printings of very short fiction -- including a very nice 12" x 15" version of "We're The Only Colored People Here". 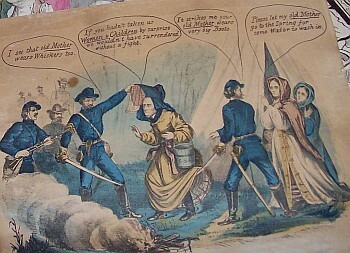 Apparently -- at the end of the Civil War -- Jefferson Davis mistakenly threw on his wife's raincoat as they were trying to flee capture by Union soldiers; when caught, he was widely mocked for supposedly "dressing as a woman" in an attempt to escape. Above is just one of the political cartoons that resulted! 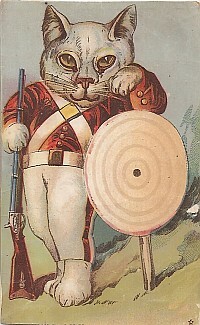 I'm inspired by those Victorian cards -- I think I'll go home and find some cats to dye! Never claim that the media doesn't affect your children, gentle readers. Let's put this inauguration in its historical context! ... and the list of ceremonies, complete with adorable tri-color ribbon! If you'd attended in 1941, you would have presented this ticket. There's the back of the ticket. And if you were lucky, you'd have been invited back in 1945! There are other things included in this little group, too -- all told, there are nine (count them, 9) pieces of Roosevelt inauguration ephemera. 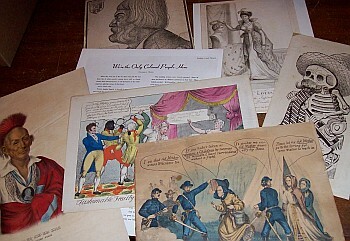 Celebrate inaugural history by purchasing this great collection for $250.00! Here ends O'Gara and Wilson Special Bulletin for today! I have to venture outside now, but at least it's a whole 20 degrees or so. Barack Obama, we hardly knew ye! This little book-shaped matchbox-holder was used to promote P.J. Carr in his 1926 campaign for Sheriff. "If elected Sheriff," the matchbox-holder promises, "I will make all of the highways of Cook County absolutely safe for every man, woman and child." Highways? What did a 1926 Chicago highway look like, I wonder? Carr is mentioned in a study by Carroll Hill Wooddy, "The Chicago Primary of 1926" (click here to read it on Google Books), which thoroughly explains that he was just another small cog in the corrupt machine we love so well. $12.50 buys you evidence of Chicago's grand old tradition ... and a cool place to keep your matches, to boot! This scarce First Edition "history of Chicago crime and politics" was written in 1952, and the Preface notes, "From the 1951 fall election returns, it was evident that everywhere in America the people were revolting against criminal-political alliances. ... Generally overlooked, however, was the fact that these conditions are not of recent development." Now there's a lesson of which we could remind ourselves today. This copy of the book belonged to Raymond J. Hederman (who was once Chief Clerk in the Circuit Court of Cook County), and I wonder if he would agree with my immediate reaction to the title -- "What a funny editorial choice, to separate crime and politics into two different concepts like that!" They do say that power corrupts. Learn how much, for only $70.00! Chemistry, technical. See Synthetic products. Chicago -- World's Fair, 1933-34. See Exhibitions. CHILD LABOR ... page 97; see also Hours of labor, Labor supply, Agricultural, Wages. 13. (Denmark, Nov. 12 '44.) Have you ever bought anything directly or indirectly from the black market? -- Yes: 10.3%. No: 89.7%. 14. (Denmark, Nov. 12 '44.) Have you any sympathy for any form of black-market transactions? -- Yes: 7.3%. No: 92.7%. One wonders what that 3% of people thinks of themselves -- you know, the ones who have had black-market transactions but don't sympathize with them. These and many other intriguing questions come up every time I flip through this book, which you -- yes, you -- could own for $60.00. Hours of entertainment, and a remarkable historical snapshot to boot! As our first Black President, Obama has already shattered one stereotype. I'm rooting for him to break with Chicago's legendary corruption, too! Let's keep history in mind as we watch his presidency. I can't wait to see what happens!